Topics: Zalatimo, Sweets Company, and Llc. Age: It went live on May 28th 1997, making it over 20 years, 10 months old. 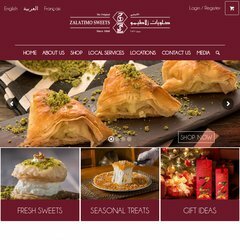 zalatimosweets.com About Zalatimo Sweets, LLC. zalatimosweets.com Contact Zalatimo Sweets, LLC. 23 users visit the site each day, each viewing 5.00 pages. The programming language environment is ASP.NET. There are 2 Nameservers, ns1.savvysitesinc.com, and ns2.savvysitesinc.com. Netfronts Inc (Colorado, Denver) is the location of the Microsoft-IIS/6 server. PING www. (64.92.119.2) 56(84) bytes of data. A ping to the server is timed at 43.0 ms.